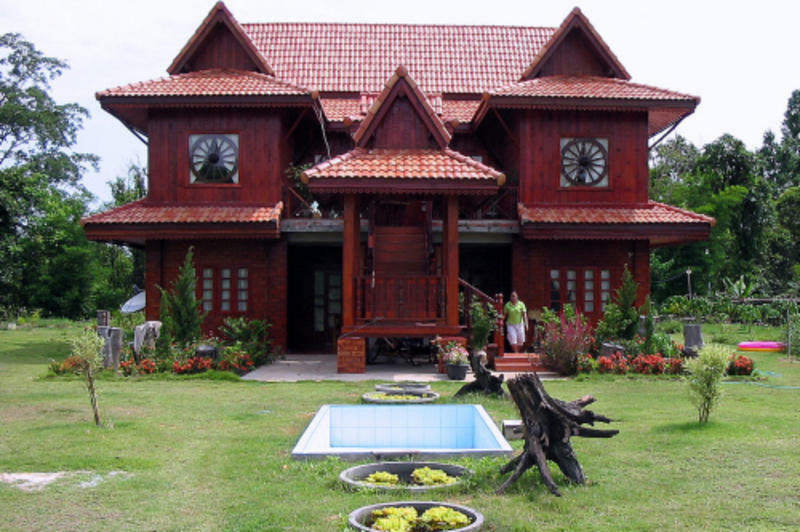 WanWisa Homestay is located in the centre of the Isan (Northeast Thailand), in Nongbualamphu province. The scenery is dominated by ricepaddys, forests and hills. The small farmer communities and villages are rarely visited by foreigners and are great to experience Thai traditional life. On many roads, wandering cattle outnumbers traffic. This makes the area relatively safe for cyclists. The small town of Non Sang and the beautiful Ubulratana lake is just a few kilometers away. From our place to the nearest community (Ban Hua Kwa) is just a two minute walk. A small forest temple is just a five minute stroll. You will be accommodated in our newly built traditional Thai style home. We offer four beautiful but simple bedrooms to our guests. The nice veranda on the second floor is at your disposal and offers great views on lushus gardens and fish ponds. A homestay is not a hotel, this means you share some facilities (e.g. sanitairy fittings) with other guests. Campers and backpackers are welcome to pick a spot in our gardens. Separate sanitairy fittings are available. WanWisa HomeStay is located in the centre of the Isan (Northeast Thailand), in Nongbualamphu province. The scenery is dominated by rice paddies, forests and hills. Be welcome at WanWisa HomeStay! Located between Khon Kaen and Udon Thani, just north of the beautiful Ubulratana Lake in Nongbualamphu province. WanWisa HomeStay provides a pick up service! Make sure you send us correct information and give your mobile phone number well in advance. You can pay the transportation costs at arrival in WanWisa Homestay. Usually a non air conditioned pick up truck is used. You can be picked up from the cities: Khon Kaen, Udon Thani, Nongbualamphu Ubulat and Non Sang. Distance approx. 76 km, traveltime approx. 75 minutes. As WanWisa Homestay and the village of Ban Hua Kwa not are signposted, please use this information for your convenience. After approx. 6 km (just before the village Ban Hua Kwa) turn LEFT and drive for 1 km (at the first bend you'll see us. NOTE: When you see a school on the left side: you are to far, take the next road into the village and ask someone. If you experience difficulties finding us, please contact us and we will be glad to help. Distance approx. 80 km, traveltime approx. 90 minutes. From Nongbulamphu: Road nr. 228 direction Si Bun Rueang. Just after a few kilometers: Road nr. 2146 direction Non Sang. After approx. 36 km you will pass through the small village of Kut Doe. Slow down or you will miss it! About 50 meters past the school you turn right. After 1 km on this road (mind the potholes!) in a bend to the left, you will see our place at your right-handside. Fully air-conditioned busses leave from Bangkok's Northern busstation Morchit. A VIP bus ticket costs about 500 Baht and take 6 hours to reach Khon Kaen. You can also take cheaper busses but they take 1 or 2 hours longer. You can be picked up from the Khon Kaen bus station or go to the non air-conditioning bus terminal to get a connecting bus to Non Sang, near Ban Hua Kwa. Tell the driver you want to get off at Non Sang. This trip takes about 90 minutes; busses have air-conditioning but not a toilet aboard. From Non Sang we pick you up (free of charge) and take you to WanWisa HomeStay.